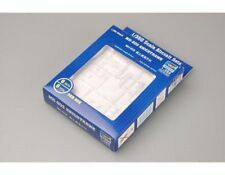 New in box, 1/350 scale, 6 sets per box. 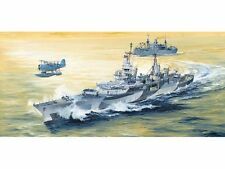 Brand New never opened Trumpeter 1/350 05603 USS CV-10 Yorktown 1944 Model Kit. Feel free to message me of you have any questions. Thanks for viewing! Trumpeter is an internationally recognized injection molded plastic model kit manufacturer that produces unique subjects of excellent detail and quality. Highly detailed 1/350 scale model aircraft. Molded in gray with black landing gear. Canopy is clear and wings sweep. This finely detailed plastic model kit requires minor assembly and painting. 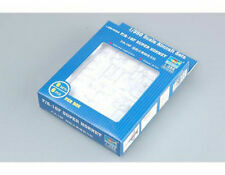 Can also be used on any 1/350th kit of a WWII British 6in light cruiser. Trumpeter is an internationally recognized injection molded plastic model kit manufacturer that produces unique subjects of excellent detail and quality. Liberty ship built during World War II and named for American Revolutionary War ship captain Jeremiah O"Brien (1744-1818). Kit features optional full or waterline hull, detailed main deck, life boats and weapons. Includes nameplate. Finished model is approximately 15 in long. Includes color painting guide and decals. This finely detailed plastic model kit requires assembly and painting. Item No 05327. Indianapolis had a distinguished career from the start. She was at sea in the Pacific when World War II broke out, then went on to serve in the Aleutian Islands in 1942–43 rather than in the Solomon Islands, as most of her sister pre-war heavy cruisers did. Trumpeter 1/350 German Prinz Eugen Heavy Cruiser 1945 TRP5313. Condition is New. Shipped with USPS Priority Mail. Trumpeter is an internationally recognized injection molded plastic model kit manufacturer that produces unique subjects of excellent detail and quality. Highly detailed 1/350 scale model aircraft. Molded in clear to enable an accurate clear canopy. This finely detailed plastic model kit requires minor assembly and painting. Trumpeter is an internationally recognized injection molded plastic model kit manufacturer that produces unique subjects of excellent detail and quality. 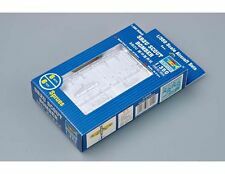 6 highly detailed 1/350 scale model aircraft. Suitable for use with modern Harrier-carrying naval vessels. Molded in clear to enable an accurate clear canopy. This finely detailed plastic model kit requires minor assembly and painting. 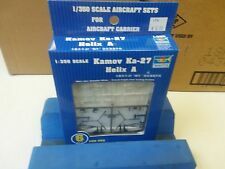 Item No 05604 Item Name U.S. Aircraft Carrier CV-13 Franklin 1944 Bar Code 6922803656045 Scale 1:350 Item Type Static Kit Model Brief Length: 775 mm Width: 125mm Total Parts 734pcs Metal Parts n/a Photo Etched Parts 2PCS Film Parts n/a Resin Parts n/a Total Sprues 29pcs Upper hull Lower hull Waterline plate Hangar decks Flight decks Display stand Paint Schemes Fighting with Japanese Kamikaze near Japan island,1944.10 Released Date n/a More Features ... Availability: Ships in 3 to 5 Business Days. USS THE SULLIVANS DD-537. NEW SEALED BOX. I wish for this to be positive. I want this to be a positive experience for both of us. HMS Belfast is a museum ship, originally a Royal Navy light cruiser, permanently moored in London on the River Thames and operated by the Imperial War Museum. Construction of Belfast, named after the capital city of Northern Ireland and one of ten Town class cruisers, began in December 1936. She was launched on St Patrick's Day, 17 March 1938. Commissioned in early August 1939 shortly before the outbreak of the Second World War, Belfast was initially part of the British naval blockade against Germany.In November 1939 Belf... Availability: Ships in 3 to 5 Business Days. Trumpeter is an internationally recognized injection molded plastic model kit manufacturer that produces unique subjects of excellent detail and quality! Set includes parts for six aircraft. Parts are molded in clear and decals are included for the aircraft. This finely detailed plastic model kit requires assembly and painting. 1/350 U.S.S. FORT WORTH LCS-3. optional position transom doors. Also includes display stand. Kit features. 0.50 Cal machine guns. separate deck fittings. 5-view painting guide and decals representing aircraft insignia, hull and deck markings. Massachusetts has the distinction of having fired the US Navy's first and last 16-in (406 mm) shells of the war. Either waterline version or full hull version can be built. Trumpeter is an internationally recognized injection molded plastic model kit manufacturer that produces unique subjects of excellent detail and quality! Trumpeter is an internationally recognized injection molded plastic model kit manufacturer that produces unique subjects of excellent detail and quality! The remaining 900 faced exposure, dehydration, saltwater poisoning, and shark attacks while floating with few lifeboats and almost no food or water. Her speed could reach up to 28.5 knots and main battery consisted of six 280 mm SK C/28 naval rifles that mounted in two triple-turrets. When WWII broke out, she began her cruise as a raider in the South Atlantic and the Indian Ocean. 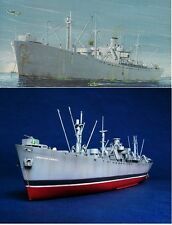 Trumpeter 1:350 Scale S. S John W Brown Model Kit. This kit is still sealed in the original factory plastic. The box has a few wrinkles but overall is in excellent condition. The Kirov class cruisers are the largest and most powerful surface combatant warships in the Russian Navy and the world. Originally built for the Soviet Navy, in Russia they are usually known by the designation Project 1144. This plastic model kit is an accurate representation of the military ship. Manufacturer: Trumpeter Models. Model Number: 4520. MSRP: 139.95. Category 1: Model Kits. Category 2: 1:100 (and higher scales). Availability: Ships in 1 Business Day!.